4.1 Why do you need a torque wrench? 4.2 Who invented the torque wrench? 4.3 How do torque wrenches work? 4.4 What tips can you suggest on caring for your torque wrench? 4.5 How often should I recalibrate my torque wrench? 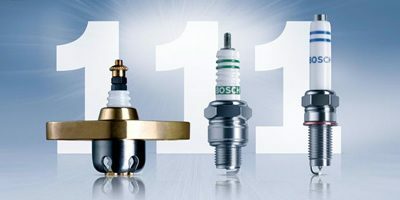 If you do much of your own mechanical work on your car, around your home or even professionally; then you know some tools are a must to have. A good example of one of these tools is a torque wrench. Many people tighten nuts and bolts randomly without ever checking the torque on them and that can be a bad thing. Most every precision nut and bolt application have a set amount of torque that needs to be applied to it; too much or too little torque can cause them to become loose or even worse yet, to break. That is why a torque wrench is such a handy tool to have available. In this article, we will show you how to shop for the best torque wrench for your needs and we’ll even provide you with some torque wrench reviews on some outstanding products. This is the torque wrench for you if you want a light duty torque wrench that you don’t have to pay a lot of money out of pocket for. CDI has made a very accurate and easy to use torquing device here. It is a dual scaled device that can be used to either tighten or loosen nuts and bolts to reach your desired torque level. We believe it is the exact same wrench that CDI’s parent company ‘Snap-on’ makes and sells for a much higher price. This very good torque wrench has an amazing price point, to say the least. It is even more amazing when you consider this product is manufactured and backed up by the extremely reputable Snap-on Tool Company. One big concern with this product is that it’s only made for light duty torqueing tasks; for bigger jobs you will need a heavier duty torqueing tool. You can also strip the ratcheting head if you are not careful when getting close to its torque limit. What is even better than having a good torque wrench? How about one that comes in a combo pack complete with a breaker bar. That is exactly what you get with this nice torque wrench kit here. It offers those who purchase it many advantages when it comes to correctly tightening nuts and bolts. 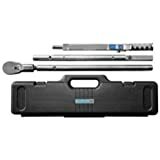 This is a reasonably priced kit that will make a great addition to anyone’s toolbox; it does not matter whether you are a weekend mechanic or a true professional. 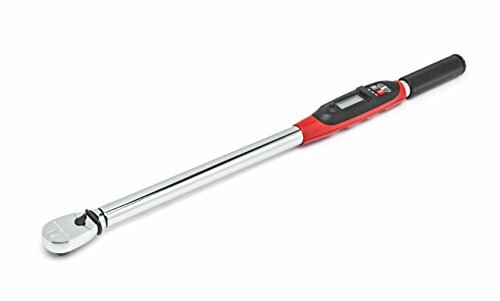 The best feature about this torque wrench is that fact that the wrench and supporting breaker bar can be adjusted anywhere up to 41 inches. That allows you both maximum leverage on stubborn jobs and the ability to work in tight spaces too. There were a couple things we were a little unhappy with on this product. The fine adjustment on it is not as smooth as we would have liked and it is also possible to assemble the telescopic features the wrong way if you are not careful. If you need an all in one adjustable torque wrench then this fine model will do nicely for you. It can handle breaking loose and tightening nuts and bolts that require up to 600-foot pounds of pressure to do so. It is a very handy tool to have. This is an extremely accurate tool that comes with its own hard case and calibration certificate. It is very easy to set the desired torque level you need and the scale on it is also very easy to read. The best feature on this torque wrench has to be the way you can calibrate it. The adjustment on it is very fine, to say the least, and it can also be calibrated in either direction. It is a dual scale product too. This is a high quality product as you would expect from a tool that is backed up by the reputable ‘Snap-On’ Company. The only concern with it was the slight possibility of it stripping out under certain conditions. This tool makes doing tightening applications that needed to be controlled very easy. It is a very simple and accurate torque wrench. It is perfect for all different types of home or professional torque applications. It is made in the USA that is a full 24 inches long so you can get some important leverage with it too. This product features smooth ratcheting action so you can easily tighten any nut or bolt that requires a specific torque setting. The ease of use of this torque wrench is second to none on our list. It is very easy to set the torque on it and very easy to read it out too. Its bright digital readout and digital controls are what make this all possible. Once the desired amount of torque is reached the display will even beep and illuminate to indicate you have reached your desired torque. There are a few things we did not care for with this model torque wrench. For one, the beep was barely audible when you reach the desired torque setting. Another concern was that the batteries were not simple at all to change. 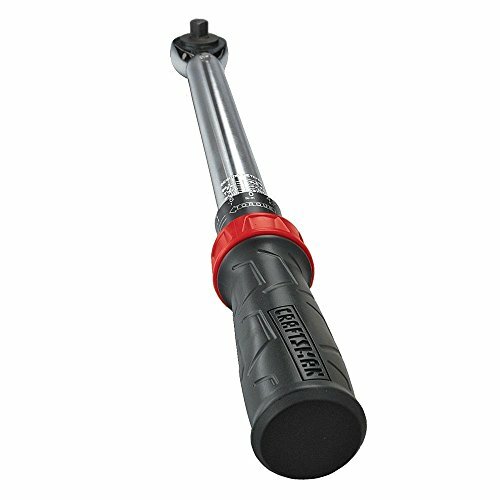 This is one of the more affordable torque wrenches on our top reviewed products list but don’t mistake that for meaning this is not a quality product. It will do an excellent job on any and all of your nut or bolt tightening or loosening needs. 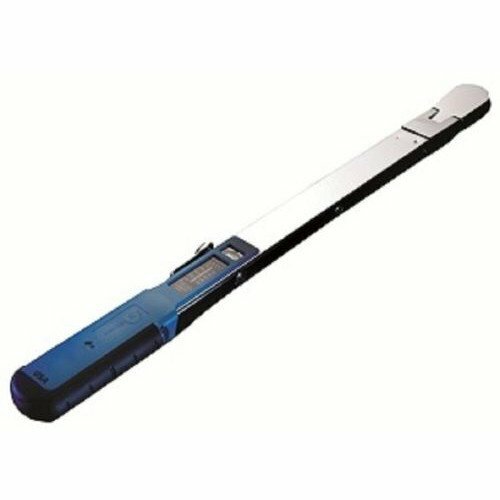 It is a very heavy duty torque wrench that can handle even the toughest tightening needs. This tool works with micrometer type precision and it also includes a limited lifetime warranty. The ¾ inch drive on this tool will make sure you can do any large or small controlled tightening or loosening jobs that you have. It’s 49 inches long to make it easy to set the torque on any not or bolt up to 600 pounds of foot pressure. There are a few things that concerned us with this torque wrench. It is a model that some users might find to be very bulky and heavy to use for one. We also think there might be some durability issues in the long run on the ratcheting mechanism. 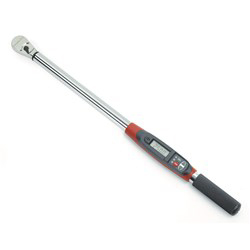 This is another nice electric torque wrench that is found on our list. It can handle torque wrenching tasks up to a full 250-foot pounds easily and conveniently. The digital readout only enhances this process even further. It is a precision device that features almost 60 teeth to handle each and every one of your delicate torquing needs. The display on this tool is very easy to read and it will buzz and light up brighter when your desired torque value is reached. When doing a torquing task the advanced digital readout will record the highest torque that has been achieved as you ratchet on the device. This makes it really simple to see where you are at as far as achieving the amount of torque specified for a particular nut or bolt. What didn’t we like about this model torque wrench? It is well-known that most electric torque wrenches cannot handle heavy duty jobs as well as other types of torque wrenches. You also don’t want to use this tool in an area with high moisture content. If you are looking for an easy to handle torque wrench that is not overly long, then this model will work perfectly for you. It weighs just a little over two pounds and is only 1 ½ feet long. It is also a very durable and accurate product that will work great for all your light torquing needs up to 300-foot pounds of pressure. The torque is easily set by simply turning and locking the handle. The two best things about this torque wrench are its lightweight, compact size and its affordable price for how good it works. If you have torque needs that are done in confined spaces this is a great tool to have handy. There were definitely a few things we did not like about this smaller size torque wrench. For one we think there may be some durability issues down the road after using it a few times. There are also some similar products on the market that are much cheaper than this torque wrench. This just might be the premier lightweight torque wrench out of all of them that we looked at. It is an amazingly accurate and easy to use device. It will make an excellent addition to any toolbox to handle any torqueing needs you have up to 175-foot pounds. It has a handy dial gauge to ensure the accuracy of its readouts and it does not have the cumbersome ratcheting motion of some torque wrenches. CDI is a subsidiary of the reputable Snap-on tool company so you also get the peace of mind that this tool will be backed 100% by the manufacturer. The design of this torque wrench was unique, to say the least. CDI claims it works using the same principles as a torsion bar on your car’s steering. It is supposed to greatly increase the accuracy of this device and according to our measurements, it really does. 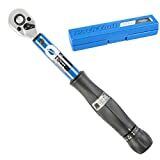 One thing that turned us off about this product was its price point for a low range torque wrench; even though in this case you do get what you pay for it seems. Even though it is small, it will still have trouble fitting into some small spaces because of its design. Here is a nice heavy duty torque wrench that comes to you at a very affordable price point. It can handle torquing nuts and bolts that require up to 600-foot pounds of pressure. That is some pretty powerful stuff there. This product will work nicely in both a clockwise and counterclockwise direction. The torque setting is conveniently placed down near the handle grip and it only weighs 10 pounds which is very light for a heavy-duty torque wrench. The best thing about this torque wrench is it’s a professional grade tool that you can purchase for a very reasonable price. It also includes a very solid ABS carrying case to protect it during storage and while you are transporting it to where it is needed. 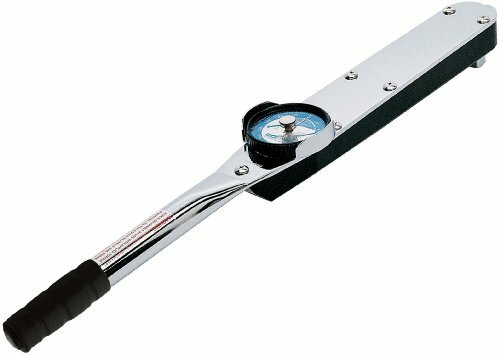 Although this tool meets the plus or minus 4% accuracy standard we here feel that a good torque wrench should do better than that. We also feel there may be some durability concerns about the ratcheting mechanism over time. Here is another high quality Precision Instruments torque wrench. It features a durable ½ inch drive torque wrench that can handle a wide variety of your everyday torqueing needs. The way the handle on this torque wrench is designed it makes it very easy to set. Once the torque is set, you can also lock this tool down and that setting. This torque wrench is very light too as it only weighs a little under 5 pounds but it will still handle jobs requiring up to 250-foot pounds of pressure. This wrench is built to last for an affordably priced torque wrench. It has a great chrome/nickel plating that will really resist rusting and breakdown. There is no spring tensioning in the torque setting part of it which will also help to increase the longevity of this tool. It is hard to tell when your desired torque is reached with this tool. Instead of a beep or other high pitched sound like many torque wrenches use, this one only has a slightly audible click that is heard when the desired torque is reached. This is a very interesting and affordable torque wrench that craftsman has made here. It measure in at about 21 inches long so it is great for working under your car or around your wheel areas. It is very accurate and passes all plus or minus 4% standard calibration settings. It is made more for light duty torquing as opposed to torquing such things as big truck tire lug nuts. With that being said, it can handle just about any small torquing task that you will encounter. Craftsman is known for making quality hand tools that last also. One of the nicer points of this torque wrench is that it can be adjusted for both metric and standard torque measurement settings. You can choose your setting simply by adjusting the lock ring that is built right into the plastic part of the handle grip. You also get a tool that is fully backed with a great warranty by the manufacturer. This is a pretty light duty torque wrench. Although you have the advantage that you can get into tight places with it, this wrench can only handle torquing tasks that are 150-foot pounds or less. It will not hold up well if you try to do higher torquing tasks than that. 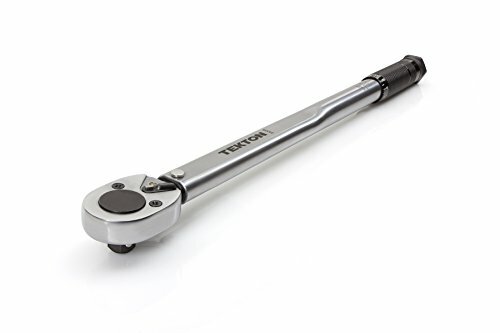 Tekton is a reputable tool manufacturer that is known for making very good hand tools that last and this very durable torque wrench fits that mold perfectly. It is made using only the finest all steel components so you don’t have to worry about such things as cheap plastic parts breaking on it. It features a very easy to read dual scale display on it to set your desired torque level as twisting the rubber grip and then locking it into position. There is a lot to like about this light duty torque wrench and its price is very affordable too. This torque wrench is really simple to use and works great. You will have no problem knowing when your desired torque level is reached because it will make a very audible click and it will torque nuts and bolts on or off in both a clockwise and counter-clockwise direction. Make no mistake about it this is only a light duty torque wrench. It cannot handle torquing requirements that exceed over 150 foot-pounds. The case that it comes in is really poor quality too. Many people make the mistake of thinking that torque wrenches are simple devices and that any old one will do any torquing task you may require. That is hardly the case and that is why you see such a wide variety of torque wrench types on our review list of the best ones. So how do you select the best torque wrench for your needs? Well like any other precision type hand tool you will have to look at a set of key characteristics that most torque wrenches possess. Here is a list of the most important aspects of torque wrenches that need to be factored into your purchasing decision. There is a huge range of qualities and prices to the assortment of torque wrenches you will find in the marketplace. You will find very few torque wrenches that are one size fits all. Prices can range anywhere from less than $40 for a simple light duty torque wrench up to almost $1000 for a heavy-duty torque wrench with all the right bells and whistles. Most of the time we first recommend setting a budget for what you are willing to spend on a torque wrench, but you have to be careful here with all the variety there is in the marketplace for these precision instruments. You have to also make real sure that you don’t assume lower cost torque wrenches don’t work well and vice versa; there are some very good deals to be had in the torque wrench marketplace. When you are torquing a nut or bolt the amount of pressure needed to get the job done just right is usually expressed in foot-pounds. Load limits a torque wrench can handle depend on how sturdy a torque wrench is. Light duty torque wrenches usually can apply torque to around 150 foot-pounds and industrial strength torque wrenches usually, can torque nuts and bolts that require 600 foot-pounds of pressure or higher. When you are shopping for a torque wrench make sure you know how many foot-pounds of pressure is required for the torquing tasks that you will be doing with your tool. If you are constantly working underneath your car when using your torque wrench you don’t want a four foot long beast of a model that is extremely heavy but that style torque wrench will work fine if you need to torque the lug nuts on tractor wheels several times a day. So size definitely plays a big role in what torque wrench you end up selecting. Make sure you get one that will work well in the space where you will be using it most often and that it is not too light or too heavy for the type of work that you will be doing. There are generally two ways in which the amount of torque that is being applied is displayed as you use a torch wrench. This is either done with a metered scale etched right into the torque wrench parts itself or by using an electronic digital display. Metered scale setting is a little tougher to work with than electronic digital displays but are thought to be more accurate by may torque wrench users. Metered scales generally will not break as easily as electronic digital displays, so they are best for working in places where your torque wrench will take a lot of beating and banging. There is no more important part of a torque wrench then how it is calibrated. International standards require a torque wrench set to be within plus or minus 4% of its actual value. Keep in mind that some torquing tasks may require you to have an accuracy that is much higher than that. 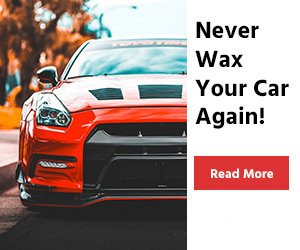 This means that you will have to be aware of the individual tolerances that are calibrated into and potential torque wrench you are thinking about buying. This is the most common way that a torque wrench will indicate to you that your desired torque setting has been met. As you ratchet a nut or bolt on or off the tool will make a very noticeable audible click. It sounds very similar to that of the noise your seat belt makes when you fasten it. This type of torque limit indicator is only found on some of the most expensive electronic torque wrenches you will find in the marketplace. The tool will vibrate much your cell phone when the desired torque limit is reached. This is another very rare torque limit indicator that is only found on torque wrenches with electronic displays. The display itself will get real bright to let you know your desired torque limit has been reached. This is another variation of the way an electronic torque wrench can alert you to the fact that your desired torque setting has been reached. Some type of audible beeping or tone will be heard to alert you that your torque needs have been met. There is a lot of variation not only in the size of torque wrenches but in the design of them too. Some of them look like extra heavy ratchets and yet others look almost like a breaker bar. 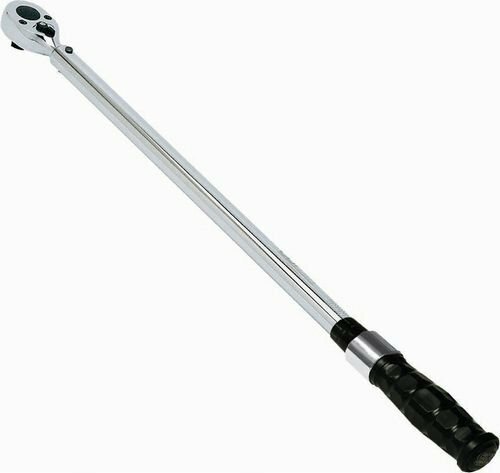 We even gave you an example in our reviews as to how one torque wrench was designed using the principles of a sway bar in your car suspension. The design should not be that big of a concern to you unless the torque wrench is being used in a confined space or you have very specific repetitive uses for the torque wrench you will purchase. When you hear the very word torque it should alert you to the fact that your torque wrench will have force applied to it as you use it. That means you better purchase a torque wrench model that is made of materials that can handle the stress that will be placed on it. Ideally, except for electronic parts or meters, the torque wrench you are looking to purchase should be made out of solid metal. Even heavy plastics cannot withstand the forces that are placed on a torque wrench when it is being used. Some brands do slide some cheap metals or heavy plastics into their designs so make sure you are aware of this. 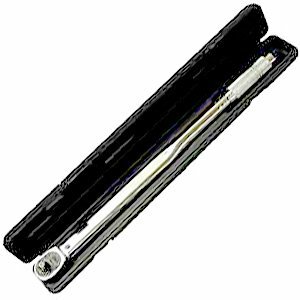 Make sure any torque wrench you purchase is made out of high-quality metal that is heat treated for strength. You can go to the store and purchase a pair of tongue and groove pliers or a screwdriver and take them home and figure out how to use them immediately, but that is hardly the case when it comes to torque wrenches. They can be somewhat complicated to use especially when it comes to setting your desired torque when using them. That is why you want to make sure that any model torque wrench that you purchase comes with an informational owner’s manual/instruction guide. Believe it or not, some model torque wrenches do not come with these. Most torque wrenches are made using quality metals and will last you a very long time but why take chances with your purchase if you don’t have to. This is especially true when you purchase a high dollar torque wrench. That is why it is extremely important to make sure what type of warranty any torque wrench you are thinking about purchasing comes with. It can also be a handy deciding factor when trying to choose between two models that are very similar. As this is a precision tool that applies force to a fastener you need to be really careful with how you use it. If you don’t work with it properly you may damage the item or even worse – get yourself injured. Our team has prepared some useful tips that you should definitely check out and put in use in order to use your torque wrench as many times as possible and keep yourself safe. Now let’s start with the fact that we talk about a hand tool here, that means that when you purchase it, it has to be from a supplier or from a store for auto parts and you have to make sure that it is calibrated. There are a lot of things to consider as proper force, torque pattern, usage of lubrication, torque direction and so on. All of these should be explained by the manufacturer and you must follow the directions. Remember that the torque wrench pretty much always has a torque range that you should not exceed. And, most importantly, always wear safety glasses or goggles. Your worst nightmare should be dropping the torque wrench. A single fall means that you need to get it recalibrated. By dropping the instrument, you can knock the accuracy off by up to 30%. 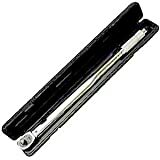 Therefore, it will be for the best if you store your torque wrench in a protective location and case. If you want to keep the torque mechanism safe you should never use the instrument as a breaker bar. Marking the torque wrench or putting any labels on it is totally forbidden. When you tighten fasteners, first do half torque and then a final one. Before tightening you should clean the dirty and/or rusty threads. As we already said, though, be careful with the lubrication process. If it not recommended by the manufacturer, then don’t do it. Most torque wrenches have different lengths. It is important that you always put your hand in the middle of the handle. One hand should be placed on top of the other if needed. When you see or hear the signal made from your torque wrench (it could be beeping, clicking, etc.) stop pulling right away. When you are finished never dial the wrench below zero, it should be dialed exactly at zero. If you have been using your torque wrench for about a year or you have reached 5 000 cycles, you need to have it recalibrated and inspected. In many cases, nuts, bolts and other types of fasteners simply have the job of holding two or more items together when they are tightened, but that is not always the case. Sometimes there are outside forces acting on a fastener too. An example of this is your vehicle lug nuts; not only do they hold the tire onto your wheel but they must also hold against the forces of motion and stress that act upon your lug nuts as you drive. 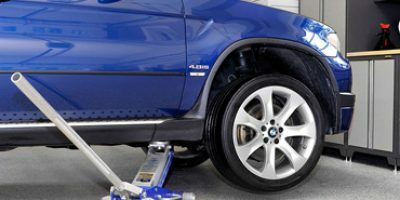 In order to get your car lug nuts to stay tightly fastened it takes a certain amount of tightening force. That is where a torque wrench comes into play. It is a calibrated tool that has settings (usually expressed in foot-pounds) on it to help you tighten a nut or bolt to a specific requirement; this helps to keep the nut or bolt from loosening as outside forces act upon it. 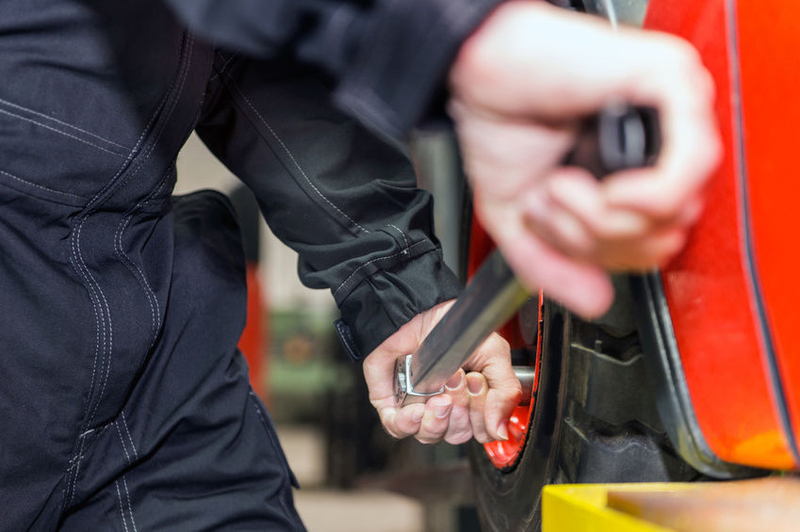 Who invented the torque wrench? Torque wrenches have been around a lot longer than most people think. As a matter of fact, they were first invented way back to 1918. The inventor, Conrad Bahr, was a New York City sewer worker that saw the need to develop a tool to properly tighten the nuts and bolts on the city’s underground steam pipes and water mains. At the time they were seeing many nut and bolt failures due to a tendency by the city’s sewer workers to constantly overtighten them. Torque wrenches are a lot like a ratchet with a measuring gauge built in most cases. Some are even quite long to provide extra leverage on fastening jobs that require an extreme amount of tightening. What tips can you suggest on caring for your torque wrench? Never immerse you torque wrench fully in water. You want to expose the sensitive mechanics in the ratcheting and torque setting portions of the tool to as little moisture as possible. If you do happen to get your torque wrench wet, then dry it off with a shop-vac on the exhaust setting or something else like a hairdryer. Lubricate the moving parts from time to time. This will ensure such mechanical parts as the ratcheting and torque setting portions of your tool will continue to function properly and resist harmful corrosion buildup. The gauges on the torque wrench must be accurate to ensure that the fasteners you tighten with your torque wrench are on properly. That is why it is a good idea to get your torque wrench calibrated occasionally. The timeframe for getting this calibration done varies depending on the amount of use a torque wrench gets and the exactness required of the torquing task it is being used for. Obviously, the more you use your torque wrench the more likely it will get out of calibration quicker. That means you will need shorter time frames between recalibration to keep your torque wrench working properly. International standards require torque wrenches to be accurate within a plus or minus 4% range but some jobs have calibration requirements that need to go well beyond this acceptable range. These more sensitive torquing tasks will also require you to get your torque wrench recalibrated much more often. While you’re here, be sure to browse our selection of jumper cables and jump starters and so much more! Hopefully, now you will have learned how to better shop for the correct torque wrench for your needs. Even if you only have a need for a torque wrench every so often there are enough affordable models around to make it a worthwhile tool to own. Follow the buying tips that we gave you when making your torque wrench selection. You can also refer to the many torque wrench reviews we provided you in order to find a great torque wrench buy. If you do these things you will have no problem finding the best torque wrench for your own personal or business needs.